It's serious enough to be called a "dress rehearsal" for Y2K—yet few people know about it. But if you depend on time and navigational data from the Global Positioning System, or GPS, you need to get ready for August 21st. GPS is a network of 24 satellites developed by the US Air Force to provide precise timing and navigation information data for the military. Though begun in the 1970s for military use, GPS has become essential for countless civilian uses as well. A broadcast-only radio system, GPS can be accessed by an unlimited number of receivers. In fact, the United States Department of Commerce's Office of Telecommunications report on GPS estimates that there are 10-15 million receivers in use worldwide. 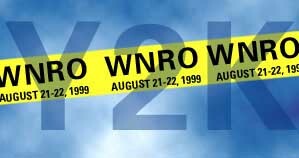 And on Saturday, August 21-22, 1999, many of those receivers could be affected by an event known as the GPS Week Number Rollover, or WNRO. WNRO refers to the way dates are processed in GPS. GPS satellites track the date by counting the number of weeks up to a total of 1,024. Then, like a car's odometer that rolls over from 99,999 miles to zero, the GPS calendar will reset to zero. Since the GPS calendar started on January 6, 1980, it will reset for the first time starting precisely 13 seconds before midnight Coordinated Universal Time (UTC) on Saturday, Aug. 21, 1999. If a GPS receiver has difficulty determining the correct date at before, during, and after this rollover, it may process data incorrectly. In fact, users who depend on GPS for geographic locations on land, at sea, or in the air, could face serious safety hazards. Since GPS technology delivers easy, accurate locations and very precise timing information, modern society's use of GPS is widespread. Some GPS receivers are hidden, embedded in a host of other products from car navigation systems to timing devices for electric and telephone utilities. Daily, users devise new applications to enhance productivity in resource management, vehicle and vessel tracking, surveying, environmental protection and restoration, precision agriculture, mining and construction, and scientific research. With all of these uses, the effects of WNRO could be extensive. GPS receiver problems could range from minor to serious. Some receivers and associated application equipment, such as electronic charting systems, could inaccurately process GPS satellite signals and produce incorrect positions, possibly unknown to the user. On the other hand, some receivers may not be able to locate the satellites and not work at all. Still other receivers may appear to be working while displaying an inaccurate date. Other receivers will be unaffected. Translated into practical terms, this could mean that dispatchers with GPS-based vehicle location systems might find their fleet tracking interrupted. In another situation, a pilot who is not prepared for WNRO might suddenly notice a heading that is off-course. Elsewhere, GPS receivers may not provide necessary information for mariners navigating their ships. These are just a few examples of the problems GPS users could face sooner than they think. But you can prepare for WNRO. First, check with the manufacturer of your receiver. GPS receiver manufacturers have been testing their products to determine performance status. For example, Trimble of Sunnyvale, California, USA, is testing its products and listing them on the company's Internet web site at http://www.trimble.com/y2kwnro. This site provides a regularly updated Product Status Table that shows how individual Trimble products are anticipated to perform at WNRO and Y2K. To get contact information for other manufacturers, go to http://www.navcen.uscg.mil/gps/geninfo/y2k/gpsmanufacturers/manufacturers.html, or call the US Government's Y2K hotline at 1-888-USA-4-Y2K. Be prepared to give the manufacturer your receiver's model number, serial number, and the firmware version number or release date that is generally displayed on the startup screen. Users should also assess the potential risk of having incorrect positions from their GPS receivers at WNRO and Y2K to determine if they should rely on their GPS receivers during these times. And finally, users should not rely on GPS for critical applications where there is a risk to life, critical data, or property. No one can predict precisely how GPS satellites and GPS technology will function in each and every application. Being prepared by following guidelines from GPS manufacturers can reduce the potential for problems, for both WNRO and Y2K. The previous news item was adapted from an article written by John Lovell, director of quality, Trimble, Inc. (Sunnyvale, CA). The article, "WNRO: Effects Could Be Worse Than Y2K," appeared originally on Oil and Gas Online, which is a sister site to Water Online within the Vertical Net family.